Hiya guys! It's the start of a new week and I am counting down the days down to the minutes for Polish Con this weekend. I'm beyond excited and if you're attending be sure to look for the girl with teal colored hair, haha. But that's not all I'm excited about this week as I have a semi-new indie on the block to show you all. 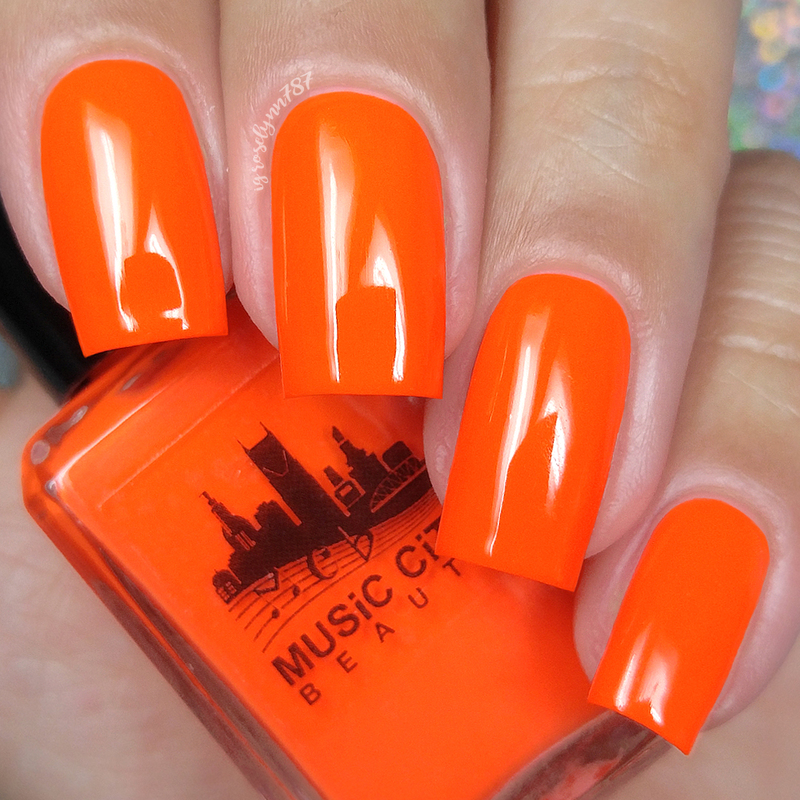 Today I'm sharing swatches for the Risque Collection by Music City Beauty, which consists of six summer ready neons. So while this is a brand new to see in the indie community, this is actually a rebranding of Smokey Mountain Lacquers. I'm so happy to be part of the new journey for Kim as she reinvents her brand and let me just say, she's kicking things off with a bang! As the name of the collection suggests, the polishes will have risque names so you have been warned. Without further ado, let's head on over to the swatches! The Risque Collection by Music City Beauty will be available for purchase Sunday, June 17th at 7PM CST. Each full-size 15mL retails for $10. Polishes will only be available individually - no sets. Red Light Special can be described as a neon red cream. Although that's the official color description I did feel like it leans more towards being orange. Like an orange-y red, like vermilion. That said, the color ended up being one of my favorites from the collection. Mostly because it's not too often that I wear orange-y shades. 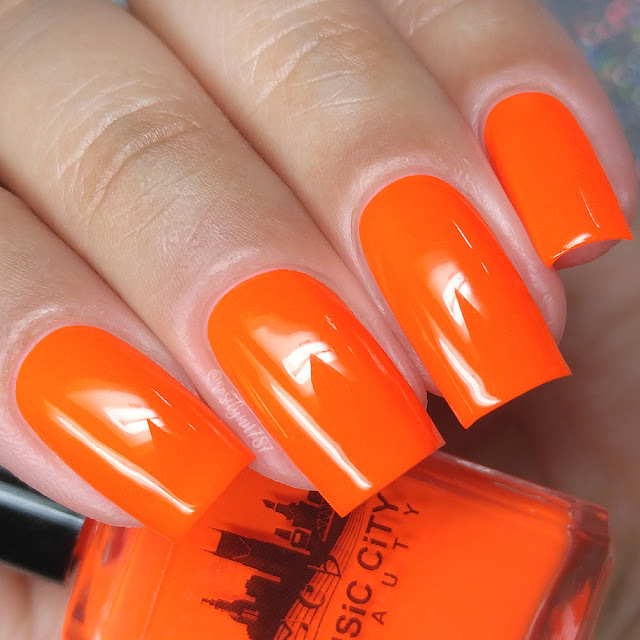 But it's super bright and fun to wear, which get used to me repeating that a lot during this review haha. I really have a feeling I'm going to get a lot of use from it during the summer, especially if I can manage to squeeze out some nail art. Plus the color looks fantastic against my skin-color, gives me such a sun-kissed goddess vibe. The formula has a really good opacity although not quite a one coater on its own. It has a nice balanced consistency that is neither too thick or too thin. Very easy to work with and layer, which is always something I adore in a dreamy cream like this. It dries down to a smooth matte finish on its own. I didn't experience any staining on removal to either my cuticles or nail beds. Definitely a huge nice surprise that I am sure many of us will love. Shown here in two coats and sealed with a glossy topcoat. Showgirl can be described as a neon magenta cream. 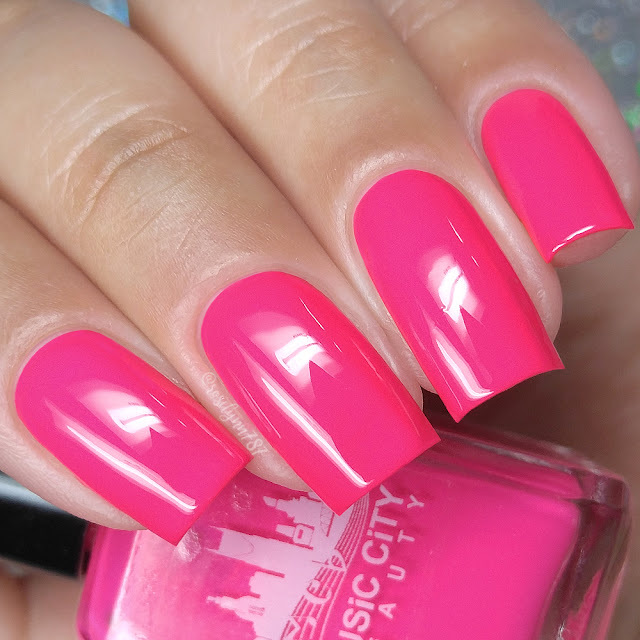 And what's a true neon collection without a pop of pink. 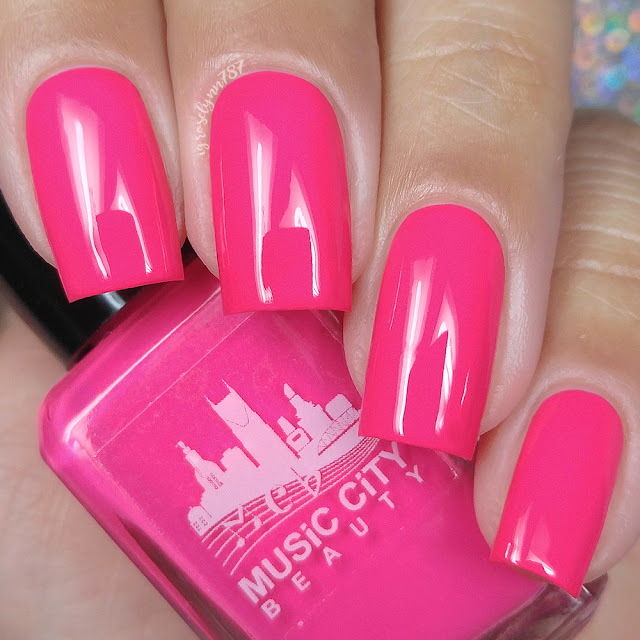 And this one is a quite the eye-popping, head turning, pinky-pink! Like with the previous shade, it's not a color I wear a lot of so this one really won me over. Though it should be noted that it's a bit more bright and neon in person. Now the color brought out a lot of warmth from my skin-tone, but it's not to the point where it clashed against the color. The formula has a very opaque application and can easily be considered a one coater. It all depends on your application style, but for me I do thin coats so I needed to layer to hide the nail line. Consistency wise it's well balanced, not too thick or too thin. Once again easy peasy to layer and work with. It dries down to a smooth matte finish on its own. I did experience some minor staining to my cuticles on removal, but none to my actual nail bed. Shown here in two coats and sealed with a glossy topcoat. Battery Operated Boyfriend can be described as a neon purple cream. First... the name, haha. This one had me absolutely cracking up laughing and that just made me love the polish even more. Of course, like all the others its super bright and eye-catching. Everything that a good neon should be! 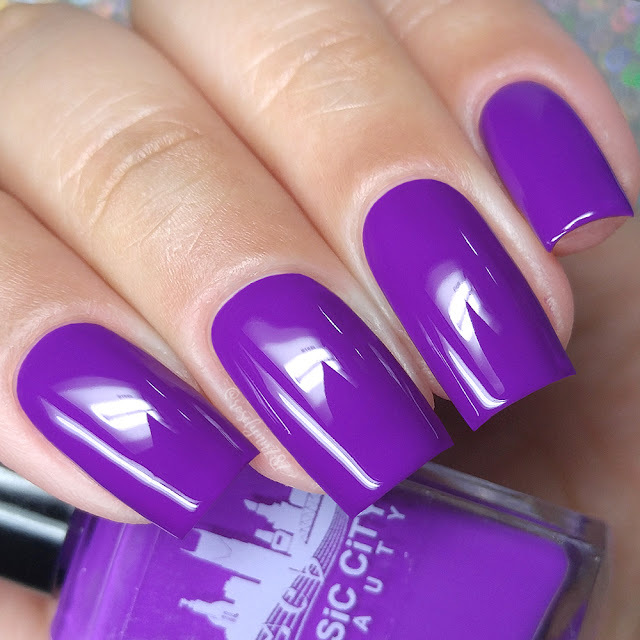 The color is the perfect purple in my book and meshes so well against my skin-tone (and against any tone for that matter). The formula has a very opaque application although not enough to be considered a one coater. 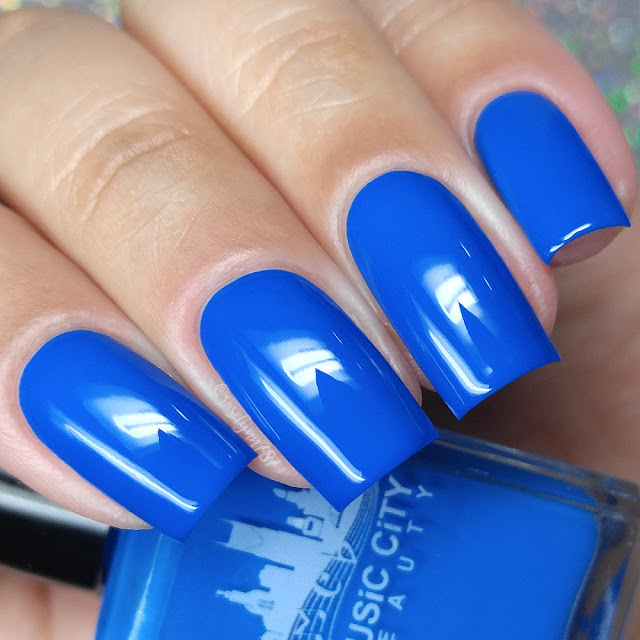 Consistency wise this on leans a little on the thin side, though it's not enough to flood the cuticles or to the sides. Just have to apply with careful strokes and not overwhelm the brush. It dries down to a smooth matte finish on its own. Once again no staining on removal to either my cuticles or nail beds. Shown here in two coats and sealed with a glossy topcoat. Aphrodisiac can be described as a neon green cream. Please note this shade leans a little more bright green in person than what photos could capture. That's the trouble with neons, they break hearts and cameras haha. It looks really good against my skin-complexion as well, which I was not expecting from this one. I know a lot of these colors go out of my personal bubble, but this one was especially worrisome to try on. 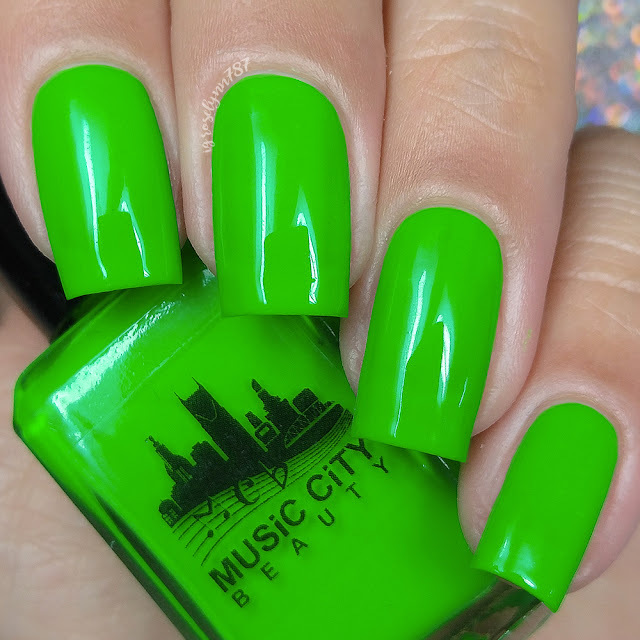 Neon greens are either a complete win or a total lose, but here we have a killer winner. I just wish my photos captured the neon vibe better for you guys. Even after color correction it was still a pain! The formula has a sheer application that is a bit patchy but does build-up for full coverage. This one seemed a little off from the rest as the consistency leaned on the thick side. However it's still manageable and isn't hard to work with whatsoever. It manages to level out with as it dries down smooth and matte. I experienced no staining on removal to my nail beds or cuticles, woohoo! Shown here in two coats and sealed with a glossy topcoat. 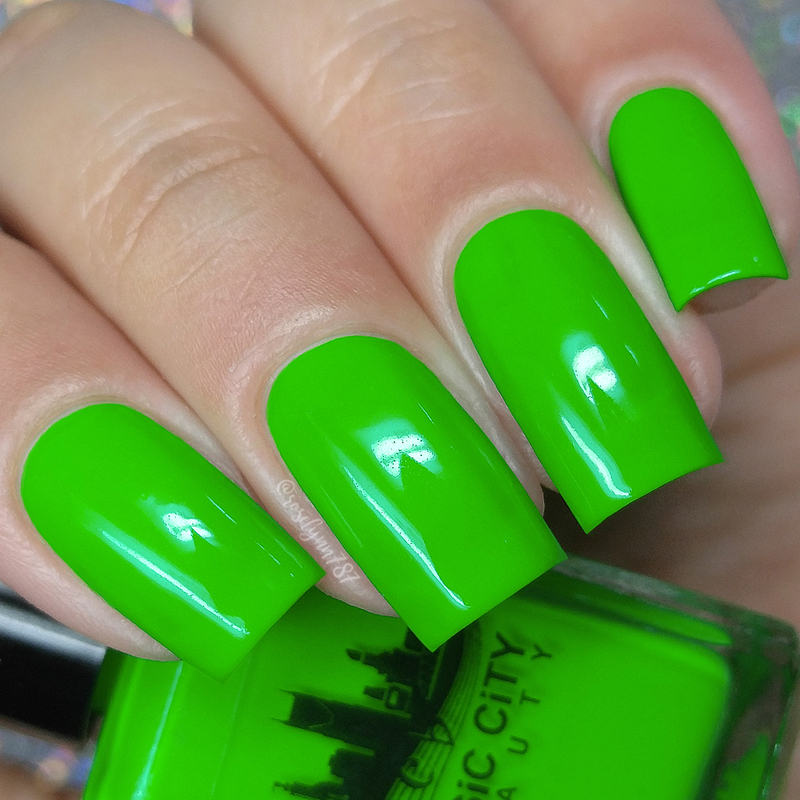 Attention Whore can be described as a neon yellow green cream. And here we have my favorite among the collection! I mean it's absolutely blinding and looks even more so in person. 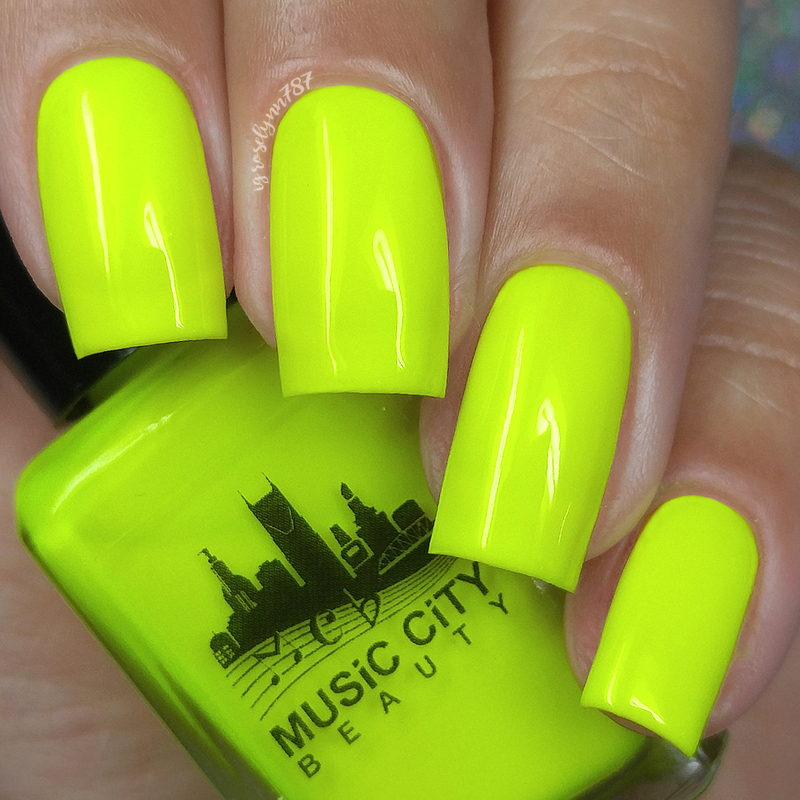 Neon yellow polishes are life and if you don't have one then trust me you need it. Even if you think yellow isn't your color. It changes everything, haha. I actually plan on wearing this one to Polish Con this weekend, a girl has to stand out after all. Like with Red Light Special the color is so neon that it gives my skin-tone a perfect tan glow. The formula has a good opacity but does apply a bit on the streaky side. Hence needing an extra coat to achieve full coverage. 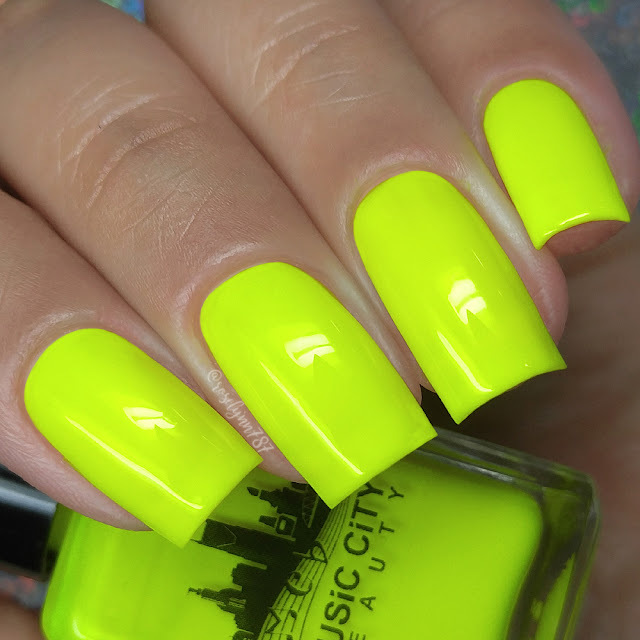 It's almost an expectation when it comes to a yellow neon that it will be a little patchy and streaky due to the pigment mixture. Consistency wise it's well balanced, which makes layering up to even the coverage an absolute breeze. Like all the others, it dries down to a smooth and matte finish on its own. Shown here in three coats and sealed with a glossy topcoat. Happy Ending can be described as a blue neon cream. Ending this review with another winning shade and I mean at this point it shouldn't come as a surprise, haha. This whole collection was filled with winners that made my heart so warm and happy. 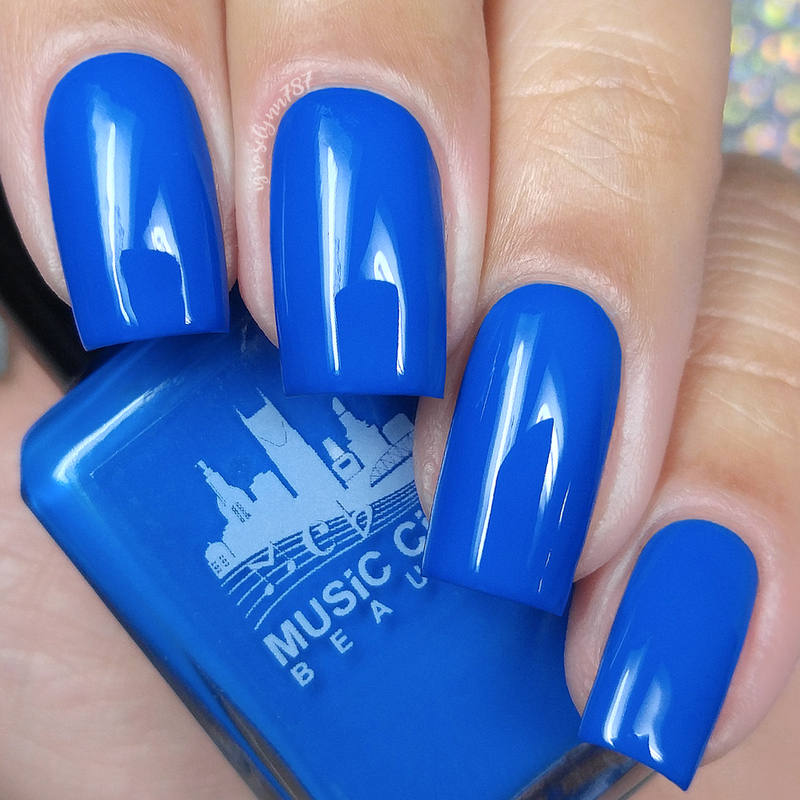 This is a brilliant shade of blue that wears beautifully against any skin complexion. The formula has a very opaque application however it's not a one coater on its own. It has a well balanced consistency, not too thick or too thin. Fits right in with most of the other cream wonders in this collection. I experienced no staining on removal to either my cuticles or my nail beds, which came as quite a surprise. Blues usually tend to stain on me, so definitely major brownie points for that alone. Shown here in two coats and sealed with a glossy topcoat. 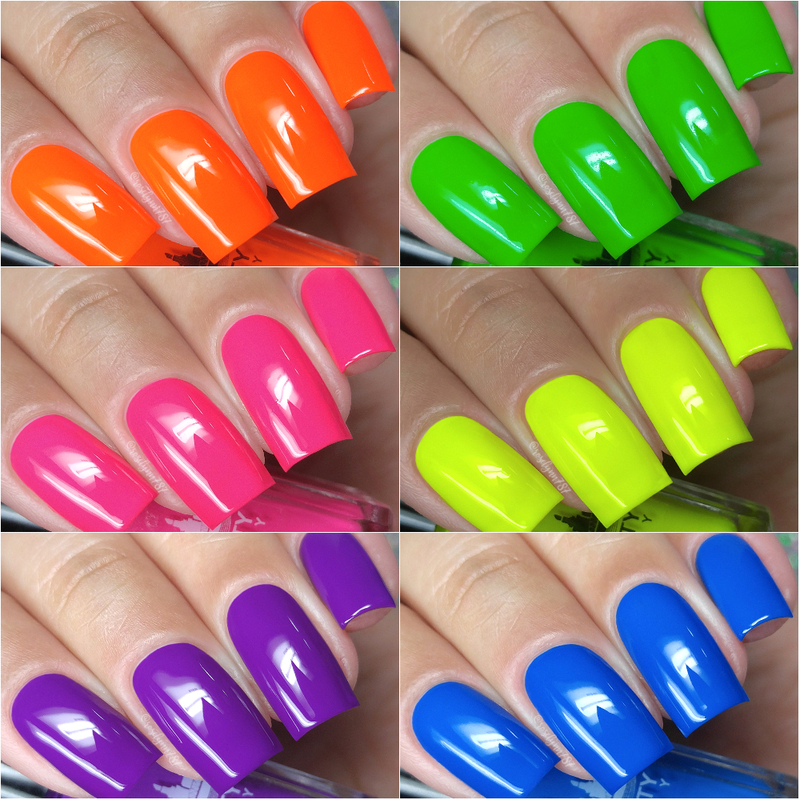 Overall notes: None of these shades needed to be worn over base in order to bring out their neon super powers. All of them watermarbled beautifully as well. And stamping worked really well over a white and black base. 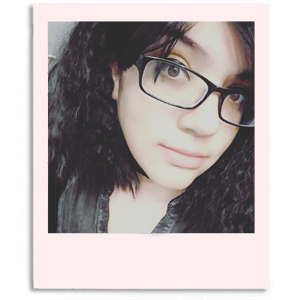 I ended up accidentally deleting my photos from my SD card for the testing I did... Sigh. But if you'd like to see examples please let me know! 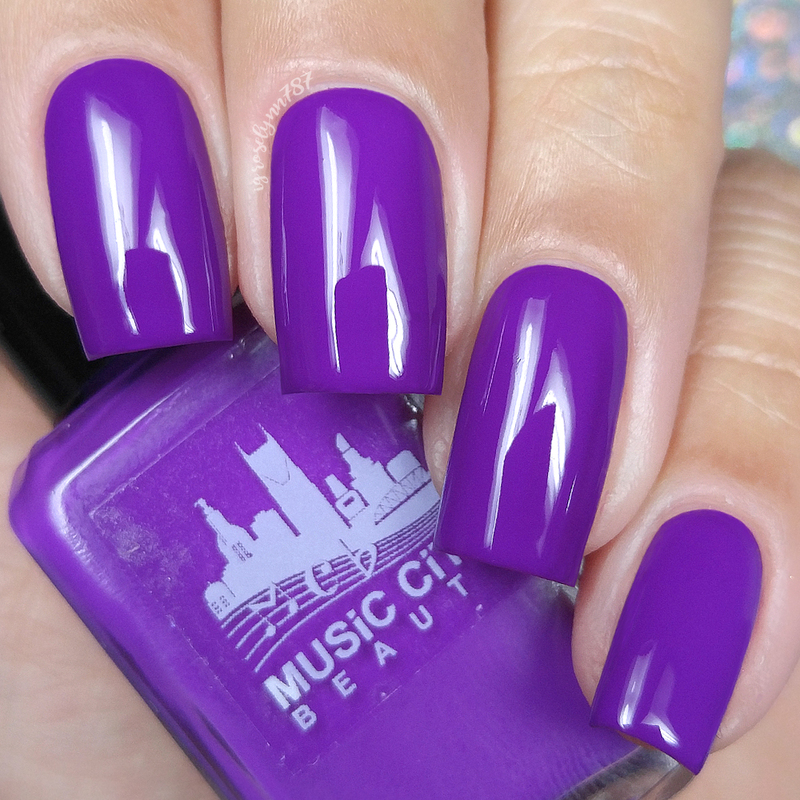 To recap, the Risque Collection by Music City Beauty will be available for purchase Sunday, June 17th at 7PM CST. Each full-size 15mL retails for $10. Polishes will only be available individually - no sets.